I'm on a research visit to RÃ©mi Gribonval's research group at INRIA (Rennes, France). So far it's been great, and maybe I'll tell you more later, but first I just want to blog a little signal-processing achievement for today. 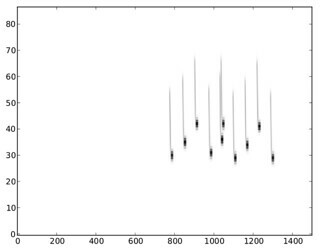 Now, in my previous research work I developed a way of tracking those chirrups, but it relied on a rather simplistic first step of detecting individual sounds. What I've been able to do, finally today, is use Matching Pursuit instead, thanks to MPTK (with the "anywave" feature which I think I have just fixed). 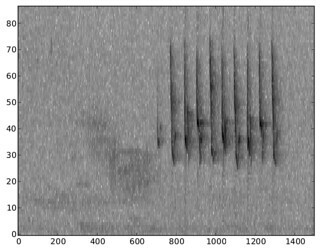 Potentially, this has some advantages in detecting birdsong syllables cleanly. Looks pretty good eh? There's one false-positive in the above, and one or two false-negatives, but the basic principle is looking good. This should be useful.